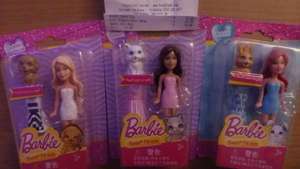 Found these mini Barbie pet series in poubdlabd today, there were around 6 diffetent ones to choose from, perfect stocking fillers. Are there a bit like polly pocket? Yes, I'd say they're a similar size...just put some away for my youngest niece's Xmas (been sorting through all the Pound buys throughout the year, haha). Poundland are starting to get annuals in too - I bought the Shopkins 2018 Annual yesterday. Yes, I'd say they're a similar size...just put some away for my youngest …Yes, I'd say they're a similar size...just put some away for my youngest niece's Xmas (been sorting through all the Pound buys throughout the year, haha).Poundland are starting to get annuals in too - I bought the Shopkins 2018 Annual yesterday. I'm looking for a couple of man figures, lol. Action figure types, anyone know of anywhere that's cheap? They are for stocking fillers.